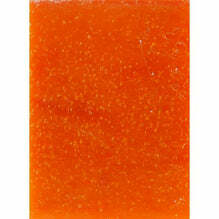 Our wattleseed scrubby soaps will remove the most inground dirt and grease and are great for hard working hands. Containing exfoliating ground wattleseed, jojoba meal and polenta, with the gentleness of shea butter and hempseed oil, these are a delight for gardeners, cooks, mechanics and others requiring an invigorating scrub. The scent of lemon eucalyptus remains fresh and strong for a very long time whilst the addition of ground coffee is great for absorbing odours on hands. Ingredients: saponified olive oil, coconut oil, shea butter, macadamia oil, sunflower oil, hempseed oil, pure essential oils of lemon eucalyptus, sweet orange and rosemary, ground wattleseed, polenta, passionflower, elderflowers, comfrey, sea kelp, peppermint leaves, ground coffee, aloe vera, jojoba meal.